Bathroom for outfit inspiration - not possible, right? Well I couldn't resist the challenge and after seeing those Missoni inspired floors I knew exactly what I wanted to do with this glamorous room. 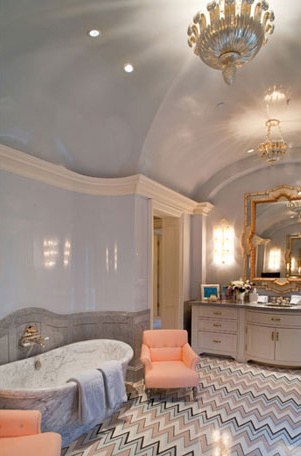 Every little detail in this lux bathroom is complete decadence. Designed by Kirsten Kelli who I used in the Seaside Chic post created the below bathroom with the cavernous ceilings and gilded hardware. I don't think anything this fancy will ever be in a home I own but I sure would like to live in this picture for a bit to imagine just how lovely a glass of wine and a bath in that carrera marble tub would be. I could have easily interpreted the above image into a full on glam slam look. I however wanted to challenge myself and take this chic bathroom and turn into something equally fabulous but more everyday!